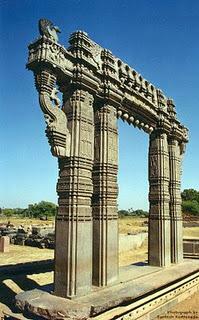 Ramappa Temple of Telangana is one of the famous temple of Telangana. Read the full article to know all the detailed information about the Ramappa Temple of Telangana. Ramappa Temple is the famous Hindu Temple of Telangana. This temple is also popularly known as Ramalingeswara temple. This Ramappa Temple is located at Palampet village of Venkatapur Mandal which is about 157 kms from Hyderabad, the capital of Telangana and about 78 kms from Warangal. This temple was built by "Recherla Rudra" who was a general in the period of Kakatiya rulers in the year 1213. This famous Ramappa Temple was built in an area of 5 acres and about 20 acres of Land is developed by the greenery around the famous Ramappa temple of Telangana. The main deity of the Ramappa Temple is Lord Shiva. So this temple is one of the Shiva Temple in Telangana. One Brahmin Sthapathi who was a residence of Karnataka complete this temple and after that this temple was known as "Ramalingeswara Temple" as Shiva is the Avatar of Lord Vishnu and Lord Rama Chandra. This famous temple of Telangana or the Ramappa Temple of Telangana took about 40 years for completion. The architecture or design of this famous Ramappa Temple of Telangana is very amazing and wonderful. You can see the beautiful Kakatiya dynasty art which was implemented on this famous Ramappa Temple. This temple was designed by Brahmin Sthapathis. You can see the classical patterns, the carving lines which makes this temple more attractive and amazing. The pillars, panels and ceilings were made as on Hindu mythology and the roof of the temple or which is also known as "garbhalayam" was made of good quality bricks. The main thing of the bricks are they are very light and if you throw a brick into water then the bricks have the capacity to float on the water surface. The Ramappa Temple was built in such a style and design that light and space can fall in the temple which is one of the main attraction of the Ramappa Temple. You can see two small Shiva shrines on the both sides of the entrance door of the temple. You can also see the Nandi which is facing at the at the Shiva shrine which is also in a very good condition after many years. You may have seen that in many Hindu Temple the position Nandi is strait to Shiva Linga but in Ramappa Temple you can see the Position of Nandi in a alert pose as it is waiting for the order of Lord Shiva. This changes of this temple is so as this temple was built by Kaktiyas. The famous Ramappa Temple of Telangana is located at Palampet village of Venkatapur Mandal which is about 11 km far from Mulugu Mondal and about 78 kms from Warangal. So any one can easily reach this famous temple of Telangana.